Read about the discovery in the New York Times. Charles Chaplin in Behind the Screen (1916) ends with quite a pie fight. Singin’ in the Rain (1952) is about the transition from silent cinema to talking movies. 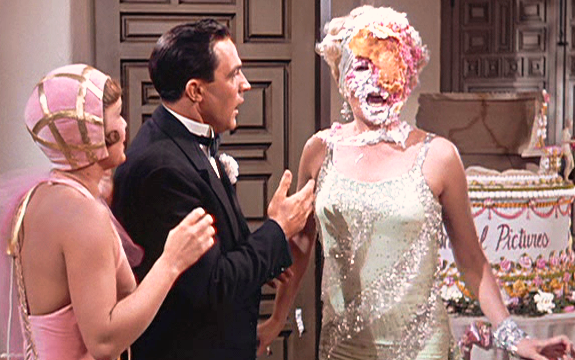 When Kathy (Debbie Reynolds) has reached her limit and tells Don(Gene Kelly), “Here’s something I learned from the movies” and she grabs a pie — Don’s reflexes are quick and Lina’s (Jean Hagen) aren’t so she gets the face covered with cream pie and screams as Kathy darts from the scene in horror. Blatantly, racial stereotypes of the era abound but don’t let that get in the way of some outstanding musical performances. The Niles Silent Film Museum had a pie fight during Charlie Chaplin Days in 2012. Looks like fun. Check its website for this year’s events. The Three Stooges carried on the pie tradition in many of their short films. The Five Stooges pie fight Shemp, Moe, Curly, Larry and Joe –For the first time ever 5 of the 6 stooges were all together and in a pie fight in Half Wits Holiday(1947). Read the rest of Sam Green’s story about that night and watch the film below. This footage was long lost but then found in the late 1990s and made into a short movie by Sam Green and Christian Bruno. Colin McCabe writing about Jean-Luc Godard at Cannes for Criterion. 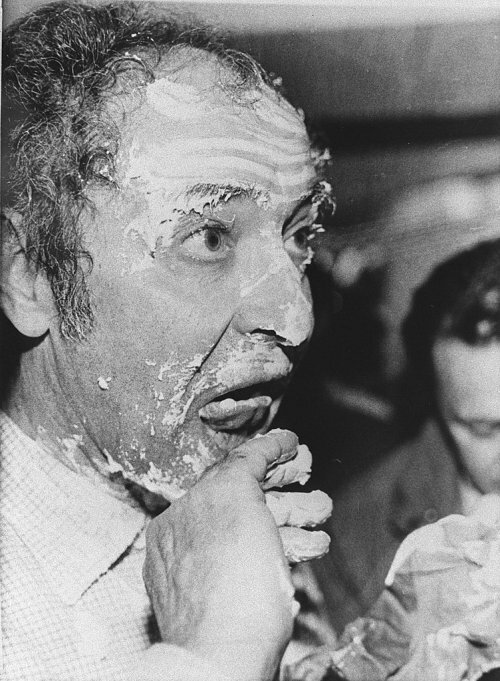 See Jean-Luc Godard get a pie in the face in this French TV news story. Anita Bryant, Bill Gates and many others get their just desserts. 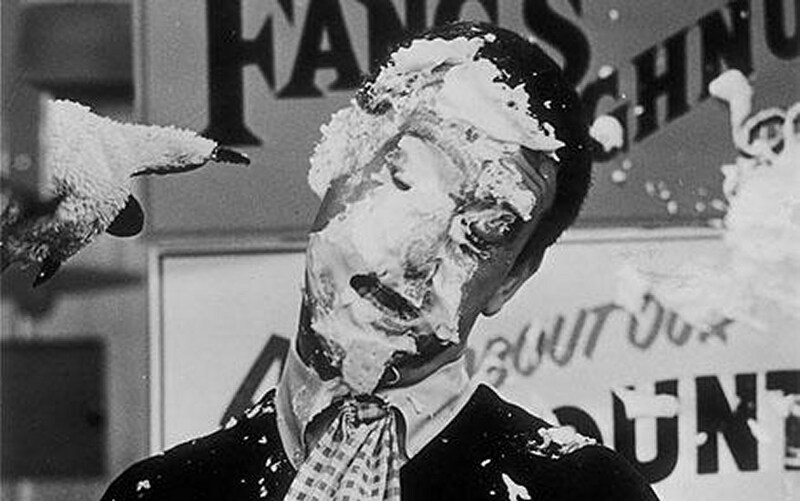 Soupy Sales estimated that he was hit with over 19,000 pies in about 5700 TV shows. One show had 400 pies thrown in 25 minutes, 100 at Soupy. A lot of celebrities were targets. Possibly the most famous Soupy Sales show when Frank Sinatra, Sammy Davis Jr. and Trini Lopez all got into the act. The Sundance-winning film by Darren Aronofsky, Pi. 21 Celebrity get Pies in the Face. The Messy History of the Pie Fight from Vaudeville to Nickelodeon. This entry was posted in Films, Films: Shorts and tagged Films, π Day, Pie Day, pie fight. Bookmark the permalink.